Concern about volatility in today’s market environment has established itself as the new norm. With 60% of HNW investors considering unforeseen market events a major threat to their wealth creation, and only 20% expressing confidence in their longer term financial plan – it’s unsurprising HNWs are also increasingly conscious of the need to prepare for the unexpected. So for a second year running, Scorpio Partnership and FactSet have joined forces to decipher just how clients interact with and entrust different elements of risk to their advisors. We surveyed over 1,000 HNWIs globally to determine whether the existing frameworks for understanding and measuring risk in the advisory relationship are sufficient – and the results are surprising. Perhaps most interesting is that in spite of the personal nature of private banking relationships, advisors often overlook gaps in investor knowledge. For example, when presented with a series of investment scenarios, more than a third of HNWIs are unable to identify a risky portfolio correctly – and of these, younger investors are most prone to selecting the wrong answer. 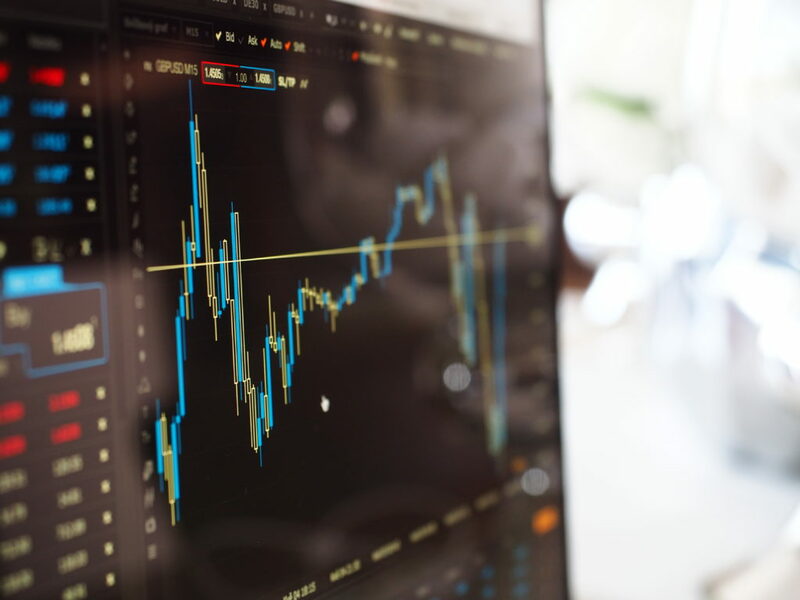 Similar gaps in knowledge emerge when HNWIs are asked to define fundamental investment terminology, such as the meaning of ‘volatility’ – leading to the emergence of a ‘blind spot’. 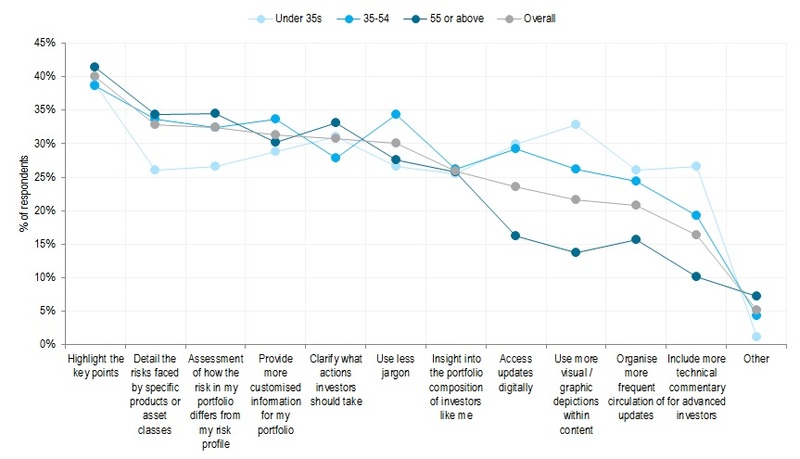 An incomplete understanding of risk profiling and processes therefore suggests advisors need to urgently make the language of wealth more accessible to bridge the knowledge gap (Figure 1). Q. How could the information on risk provided to you by your wealth manager be made more useful? Many HNWIs are unclear about the actual implications of risk profiling on their future investment activity making them hyper-sensitive to market shocks. Indeed, less than half (44%) understand the reasons for their given risk profile – or the influence it could have on their portfolio – making them susceptible to knee-jerk reactions and major investment strategy changes in times of volatility. By clarifying the significance of risk profiling for investor activity and being more transparent about how risk profiles are built – and what they mean – advisors can (re)build confidence in investors’ long-term plans. At the same time, introducing features such as behavioural data to improve understanding of client sentiment can help assuage the multiple threats investors fear will impact their wealth preservation and creation. Predictive methodologies can gauge likely reactions to different scenarios helping advisors prepare and better leverage the appropriate response. Advances in technology are rapidly changing the nature of client-advisor interactions. The need for both parties to understand the strengths, limitations, and trade-offs between existing human and digital capabilities is therefore becoming increasingly important. Given that the world’s wealthiest investors (those whose wealth exceeds $20 million) conduct nearly half (44%) their interactions with wealth management firms online – there is considerable scope for advisors to make better use of digital solutions. Promoting digital integration and augmenting the human advisory relationship with technology should therefore be the next frontier, helping improve efficiency, flexibility and ultimately delivery of service to clients. “The goal of this research is to help clients strengthen their business, drive greater engagement from their clients and build more efficient, responsible, profitable organisations,” says Mr King. And while our research highlights a combination of challenges facing wealth managers and investors alike – it also presents a world of opportunity. Clients reveal that advisors need to refocus their efforts from risk management to resilience building if they hope to maintain and strengthen relationships in these turbulent times. Consequently, by shifting the industry mindset from risk to resilience, wealth managers can open themselves up a spectrum of potential opportunities that exist across the proposition and relationship. 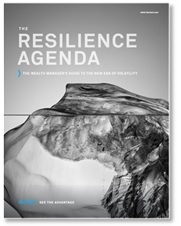 To learn more about how behaviours must shift, simply download the full Resilience Agenda: The Wealth Manager’s Guide to the New Era of Volatility eBook here. Background: Prior to joining the Scorpio team, Jenny worked at UBS Investment Bank in New York. She has also worked at FreshMinds, an insight and innovation consultancy in London, where she was involved in a range of financial services projects. Education: Jenny holds a BSc Economics and International Development from the University of Bath and a PGC International Business from the University of Chester. And at the weekends: Jenny is usually outdoors – playing racquet sports, hiking, skiing, or taking part in some kind of sporting activity. And living out her favourite inspirational quotes.